Many thanks for your letter of the 4th which greeted us on arrival here a week ago last evening. Because of head gales and high seas we were twenty-four hours behind schedule in docking at New York, but the “Queen Mary”RMS Queen Mary, an ocean liner that sailed primarily in the North Atlantic Ocean between 1936 and 1967 for the Cunard Line (known as Cunard-White Star Line when the vessel entered service). is such a huge vessel that we hardly noticed any movement though there were, as I was told, some landlubbers on board who thought that it was a fearful experience! What you write about the two gold strap-endsThese strap ends have not been identified. is full of promise and I hope we may soon hear from you what Kaleb. has been able to do in his jockeying for a price position! En principe,“In principal.” we are definitely interested; photos or squeezes would help, of course, but are not absolutely essential. We have seen the Peirce miniature mosaic,BZ.1947.24. 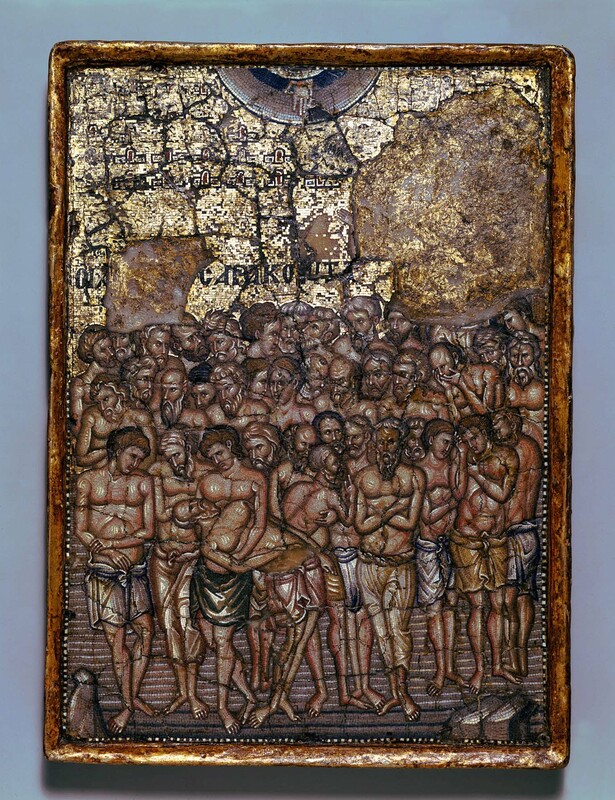 The Blisses had the opportunity to acquire this mosaic icon in 1931, but did not pursue the purchase. See letter of March 30, 1931. Hayford Peirce acquired the mosaic icon for £880. See letter of August 12, 1931. which is a wonder. I am about to write “Polly”Polly Brown Peirce, Hayford Peirce’s wife. to tell her how grateful and pleased we are to have at Dumbarton Oaks such an object as a memorial to Hayford. She has left at Dumbarton Oaks, as a loan, the rock-crystal ringBZ.1963.6. (?) 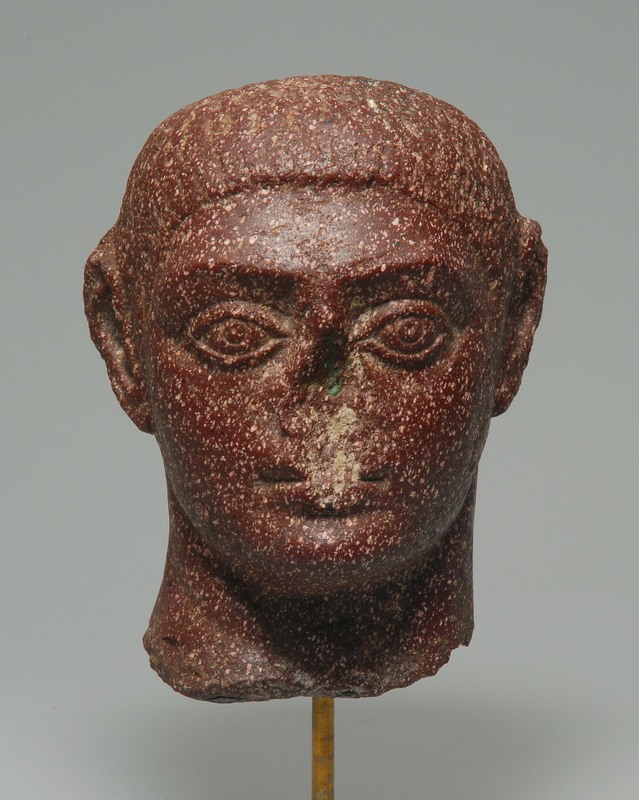 and a red porphyry head,BZ.1963.5. both of which are very fine. In addition, she has deposited at Dumbarton Oaks, also on loan, that part of the collection of coins which was in America with the assurance that those coming from Europe will be added upon arrival.Dumbarton Oaks acquired the coin collection of Hayford Peirce in 1948. I have not seen the coins yet but Jack Thacher says they are very fine. He has seen “Polly” several times, both at Bangor and elsewhere, and seems to be in close correspondence at the moment. Yesterday afternoon Mildred gave a delightful little informal talk at Dumbarton Oaks, outlining the impressions of our trip, to the assembled scholars, Fellows and staff. She did it with her usual charm and held the attention of them all. When she had finished, we showed them the things we had brought from Europe; the object most admired was the Greco-Egyptian (?) 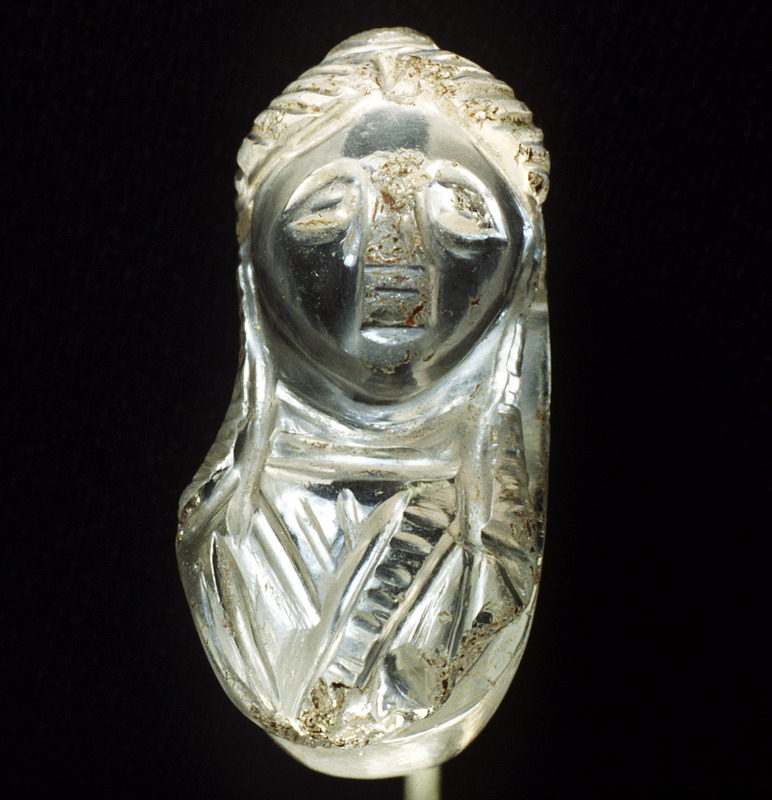 ivory razor,This ivory razor has not been identified and is not in the Dumbarton Oaks Byzantine Collection. which was acclaimed by all. None of the objects have yet been studied but they seemed to meet with approval, except the small terracotta altar.This terracotta altar has not been identified and is not in the Dumbarton Oaks Byzantine Collection. This piece, one of the Fellows stated, has been in circulation for some time and is generally conceded to be a fake. I shall go into the matter thoroughly with him and the other Fellows later on to see what the final verdict shall be. Would you think me a great bore if I asked you to bring me a dozen collars when you come over in January. I ordered two dozen from my shirt-makers (Jourdain & Brown,Jourdain & Brown, English shirtmakers at 14 rue Halevy, Paris. 14 Rue Halevy, Paris—back of the Opera) but should not dream of imposing but half of the order on your kindness! Besides, two dozen might excite the suspicion of the customs officials in New York, whereas you can get by with one dozen especially if not packed in a box. If this is not a bother could you have your secretary telephone to Jourdain & Brown to have one dozen only delivered to you wherever you choose to indicate. If this should not be convenient, do not hesitate to say so and I shall perfectly understand. I talked with David FinleyDavid Edward Finley Jr. (1890–1977), an American lawyer who was the first director of the National Gallery of Art, Washington, D.C. and John WalkerJohn Walker III (1906–1995), an American art historian and curator at the National Gallery of Art, Washington, D.C. Walker would be the second director of the Gallery, between 1956 and 1969. a couple of days after my return in regard to the Vienna collection coming to America.Art Treasures from the Vienna Collections, an exhibition of 279 objects—including paintings, bronzes, Greek and Roman antiquities, ivories, gold and silver objects, and tapestries, mostly from the Kunsthistorisches Museum, Vienna—were lent by the Austrian government in gratitude to the American people for the rescue of the works from the salt mines of Upper Austria, where they had been hidden during the Second World War. The exhibition was at the National Gallery of Art, Washington, D.C., between November 20, 1949, and January 22, 1950. The exhibition continued to the Metropolitan Museum of Art, New York, the Art Institute of Chicago, and the M. H. de Young Memorial Museum, San Francisco, and had already been on view in London, Paris, Zurich, Brussels, Amsterdam, Stockholm, and Copenhagen. See Art Treasures from the Vienna Collections, Lent by the Austrian Government (New York: Metropolitan Museum of Art, 1949). From them I learned, confidentially, that at the Metropolitan Museum (Francis Taylor,Francis Henry Taylor (1903–1957), an American museum professional who was director of the Metropolitan Museum of Art, New York, between 1940 and 1955. Director) they have been working on this matter, instigated apparently by Theodore Rousseau.Theodore Rousseau Jr. (1912—1973), an American art historian and vice director and curator of European art at the Metropolitan Museum of Art, New York. Walker is a little puzzled in regard to the whole matter because he had been told by Rousseau that the whole collection is to go back to Vienna from Stockholm, and that then a new selection is to [be] made for exhibition in the U.S.A. Now, it is my impression that the Austrians want to have the things come to this country from Stockholm in order to avoid their return to Vienna and to delay their being set up there as long as possible. The matter being under discussion or negotiation by the Metropolitan Museum people, the National Gallery of Art is not expecting to take any part until it has advanced considerably further, and is then expecting to be used as the channel for negotiation with the State Department in effecting the final details from the international side. This is not my notion of the situation, as I gathered from what you told me on the eve of our departure. We have not yet seen Betbil,The Bliss abbreviation for Bettine Tyler and William Royall Tyler. though we have had several telephone talks with each one of them. All is well with them and Milrob is to have Christmas luncheon with them. We are keenly looking forward to seeing the quartette.Bettine Tyler and William Royall Tyler, and their children Royall Tyler (b. 1936) and Matilda Eve Tyler (b. 1939).